2.5 S trim, Brilliant Silver Metallic exterior and Frost interior. CARFAX 1-Owner. EPA 32 MPG Hwy/23 MPG City! CD Player, Keyless Start, [K01] CONVENIENCE PKG, iPod/MP3 Input. CLICK NOW! iPod/MP3 Input, CD Player, Keyless Start Keyless Entry, Remote Trunk Release, Child Safety Locks, Electronic Stability Control, Bucket Seats. CONVENIENCE PKG 8-way pwr driver seat, auto on/off headlights, dual illuminated visor vanity mirrors, sunvisor extensions, leather-wrapped steering wheel w/audio controls, pwr front windows w/1-touch auto up/down & auto-reverse, key operated front windows up/down, key fob operated front windows down, 16" alloy wheels, Bluetooth hands-free phone system (w/blonde interior wood trim finishers). Nissan 2.5 S with Brilliant Silver Metallic exterior and Frost interior features a 4 Cylinder Engine with 175 HP at 5600 RPM*. "The 2012 Nissan Altima is a solid pick for a midsize sedan or coupe, particularly if you're looking for something with some sporting flair" -Edmunds.com. Great Gas Mileage: 32 MPG Hwy. 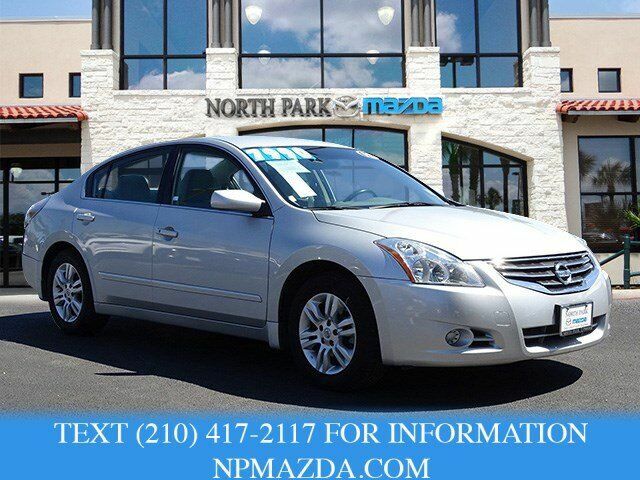 We are the premier certified Mazda dealership in San Antonio and South Texas area. We have a large online selection of new and used Mazda vehicles and a sales team willing to go the extra mile to ensure you find the car that's right for you. Please feel free to browse our web site and research your next purchase, schedule a test drive or service, or contact us with any questions you may have regarding the car buying process.